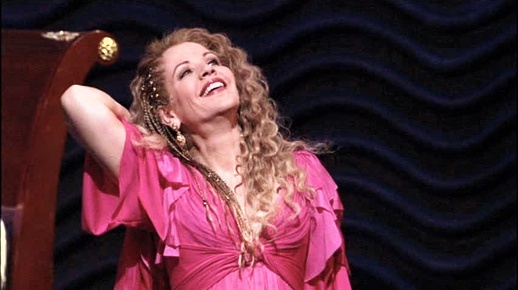 Like Liza Minnelli at the Palace or Nomi Malone in Goddess, Renée Fleming‘s Thaïs is better understood as diva event than Gesamtkunstwerk. It’s an opportunity to watch a star lady do her voodoo in a work that exists largely to showcase her glamour and appeal. An endless scene and a half transpires before the above-the-title lady in question finally makes her grand — and stunningly gowned — entrance, but to be sure when she does finally appear everyone onstage screams “Thaïs!” just in case we might have otherwise missed her. Fleming is not an exact physical fit for the role; her blond, dimpled good looks are more suggestive of a regional beauty queen (Miss Indiana? Pennsylvania, perhaps?) than the impossibly gorgeous and exotic lust object the libretto is constantly reminding us Thaïs is. But her singing is mostly strong and accurate — and, for the most part, refreshingly free of the bad habits that earned her the nickname La Scoopenda. The bulk of the role lies in a comfortable soprano mid-range that suits her voice, and she handles many of the higher notes with grace and musicality. Her interpretation of “Dis-moi que je suis belle” at the beginning of Act 2 is a particularly moving and well-sung performance sure to please her fans. She only resorts to screaming at the very end of act 3, where Massenet wrote a repeated phrase escalating to high D (finally settling to a pianissmo high A) that could confound almost any soprano without a superhuman instrument. Even then she hits the correct pitches with at least fifty percent accuracy. As for acting, the character of Thaïs is so ridiculous – a wanton prostitute (excuse me, “disciple of Venus”) so successful at her trade that the entire community riots when she decides to give it up and join a convent – that the production and Fleming settle for creating a series of Diva Moments rather than trying to make the character seem real. She mounts a ramp just to sing a single high C, then skitters back down to give Athanael the least romantic kiss seen at the Met since Karita Mattila licked the head of John the Baptist! She caps an aria by hugging herself and beaming adorably as the Met audience showers her with applause! She throws herself on a bed and laughs hysterically — then her laughter turns abruptly to weeping! She cackles; she burns incense; she waves her arms over her head! Fleming’s musicality is strong enough to transcend this nonsense, but she does seem to have a gay old time playing a singing Theda Bara. However, those perpetual dramatic indulgences are a cinch to make the production more appealing for devotees of camp. 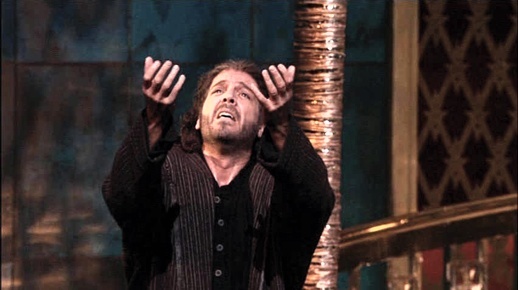 Thomas Hampson sings the role of Athanaël, which offers roughly equal stage time to the soprano part but far less musical or dramatic interest. 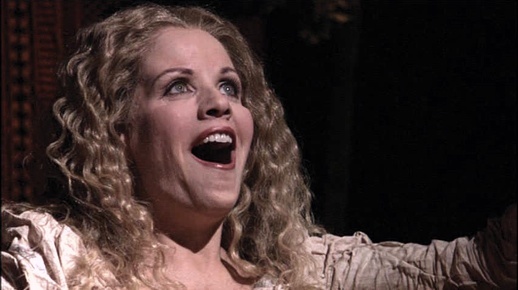 Athanaël is a bit of a Norman Maine/Stedman Graham role – even when Thaïs is not onstage, he’s always going on about her – but Hampson sings it beautifully, though perhaps his Athanaël would be more compelling if his singing reflected more of the character’s emotional turmoil. His acting skills are much more problematic, especially in close-up. His dramatic interpretation is limited to two emotions: tormented (this involves brow-furrowing) and boyishly gleeful (“Look, ma, I’m singing!”). Neither facial expression offers much insight into Athanaël’s tortured attempts to reconcile his love of Jesus with his lust for Thaïs. Concertmaster David Chan offers the musical highlight of the DVD with a brilliant interpretation of the famous violin “Meditation” between the scenes of Act Two. The composition is undoubtedly the most beautiful melody in the opera – Massenet liked it so much he repeated it almost non-stop for the third act as well – and Chan gives an emotional performance that traces Thaïs’s difficult journey from the empty glamour of sin to the simplicity of saintly living. The Meditation is the one moment in the entire opera with true emotional resonance; it’s impossible not to be disappointed when it ends and the curtain rises on yet another closeup of Tom Hampson’s scowl. John Cox’s physical production is a potpourri of Art Deco and period elements – dreadlocks for Athanaël and his fellow monks, Roaring Twenties costumes for Thaïs’s decadent circle of friends. The sets are mostly spare desert scenes or under-furnished interiors with the exception of the palace set in Act 2, a disaster in gold plate (even the palm tree sparkles!) that suggests Brighton Beach more than the banks of the Nile. The Christian Lacroix gowns for Thaïs are the one visually stunning element of the production; even the robe she wears to walk across the desert until her feet bleed is a stylishly draped off-the-shoulder number. Jesus López-Cobos (“my countryman,” Domingo helpfully reminds us in the introduction) conducts a dignified, nuanced reading of the score by the typically excellent Met orchestra. The only special feature is a compilation of the intermission interviews that aired during the original HD broadcast. We are granted the opportunity to hear Domingo repeatedly pronounce Massenet as though it rhymed with “bassinet,” learn a bit about the costumes, and discover that Fleming is particularly fond of Thaïs’s Act 2 aria because it addresses the uncomfortable but eternal truth that “youth fades.” The (sadistic?) director chooses a tight close-up of the star for this interview, but it must be said that whatever you think about Renée Fleming in Thaïs, the diva looks good.